Having lived in South Carolina for over 22 years, Blake is considered one of the locals here at Laudisi. He comes from a family of three older brothers that's grown considerably with the addition of Blake's lovely nieces and nephews. Family is a huge priority in Blake's life, and since they all live within 15 miles of each, spending time with them is all the easier. As one who likes to tinker and work with his hands, Blake's developed a knack for fashioning knife handles as well as being quite the car hobbyist — involved in everything from refurbishing and fixing them up to following Kyle Busch in NASCAR to dreaming to one day speed down the Autobahn in Germany. Fun, caring, good-humored, and hard-working, Blake is a welcomed addition to our team of Shipping Associates, ensuring that all orders are securely packed and quickly sent out from our facility on their way to new homes. 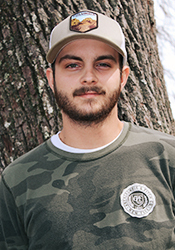 When he's not involved in picking, packaging, and processing orders, you'll likely find Blake fishing, listening to oldies rock and country music, or seated around a bonfire with his family.